David Pierce and Jon Thornton founded the law firm of Pierce & Thornton after practicing together in the litigation section at the largest law firm in the Tidewater area. 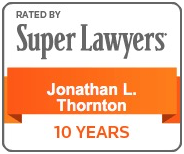 Mr. Pierce had been a partner in the firm since 1992 and Mr. Thornton was a senior litigation associate. Mr. Pierce defended physicians and other health care professionals in medical malpractice actions for 12 years and conducted a general insurance defense and civil litigation practice. Mr. Thornton conducted a general civil litigation practice including plaintiffs' personal injury and general defense work. Pierce & Thornton focuses its practice on plaintiffs' personal injury law with a particular emphasis on plaintiffs' medical malpractice and motor vehicle accident cases. While the focus of their practice is medical malpractice and motor vehicle injury law, they also handle a variety of personal injury matters including injuries as a result of defective products, including pharmaceuticals, assaults, as well as business torts including fraud, libel and slander. Pierce & Thornton's defense experience provides them with a unique and distinct advantage in their plaintiffs' practice. Put their 44 years of legal experience and medical knowledge to work for you and get the full recovery you deserve. THE OUTCOME OF A CASE WILL DEPEND ON A VARIETY OF FACTORS. Dermatologist failed to remove a suspicious mole, resulting in metastatic melanoma and death of the patient. Assault and battery of client resulting in traumatic brain injury. Failure to diagnose transected popliteal artery during surgery, resulting in permanent nerve damage (including foot drop) to the right leg and foot of 15 year old patient. Pathologist failed to properly evaluate skin lesion for presence of melanoma, resulting in metastatic melanoma and death of the patient. Physician failed to diagnose and treat endocarditis (heart infection), which resulted in patient's death. Hospital administered Cipro to a patient whose chart reflected allergic reaction to the drug, resulting in burns to his body. Death of child as a result of sepsis from punctured liver during liver biopsy. Defective equipment injured construction worker resulting in multiple fractures and mild traumatic brain injury. Failure to diagnose abdominal aortic aneurysm in emergency room, resulting in patient's death. Loss of fetus as a result of patient having gastric bypass surgery while pregnant without being told of positive pregnancy test results. Tractor trailer crash, resulting in death of retired school teacher. Failure to treat urinary tract infection in emergency room setting, leading to sepsis and death of patient. What Should I do When I am Involved in an Automobile Accident?